It’s sweltering outside and the last thing you want is a meal hot out of the oven. This Vegetarian Summer Sandwich will not only keep you cool in the kitchen, but will also get you out of it in a jiffy, so you can get back to enjoying those last days of summer. Kontos Foods, maker of artisan flatbreads and other ethnic foods, suggests using Kontos Hummus Flatbread as the base—just throw the flatbread in the toaster oven for a few minutes and they’re ready to be a delicious canvas for these healthy, flavorful toppings. Top it off with plenty of fresh-from-the-garden basil, and another tasty flatbread, and you’ve got summer in a sandwich. This recipe serves 2. Mash two ripe avocados with a fork and combine in a bowl with 2 teaspoons of fresh lemon juice and 1 tablespoon of fresh chopped basil. Cut ½ cup roasted red peppers into strips. Toast 2 whole pieces of Hummus Flatbread in toaster oven for 4 minutes. 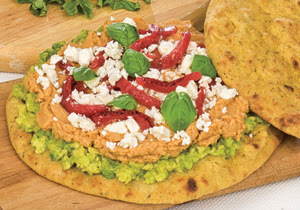 Place one flatbread on cutting board and spoon on mashed avocado mixture, and a layer of roasted red pepper hummus. Top with Feta cheese and strips of roasted red peppers. Top sandwich with second flatbread, cut in quarters, plate and enjoy your delightful vegetarian summer lunch or dinner. “This sandwich is packed with summertime flavors and is a great alternative for anyone looking to shakeup their fast-meal options, especially in the middle of summer when cooking in a hot kitchen can be a chore,” said Steve Kontos, vice president and owner of Kontos Foods. 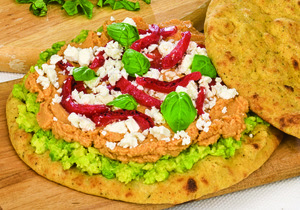 “Kontos Hummus Flatbread is fresh and a perfect complement to so many healthy sandwich toppings.” Visit www.kontos.com to learn more. You have combined two of our favorite ingredients here: hummus and avocado. This is a great sandwich for the hot weather and it is so easy to change it to make alternatives. You can use fresh tomato pieces, different cheeses, olives or different flavors of hummus.